This custom guitar strap was created for Jeri's favorite Football star ever! 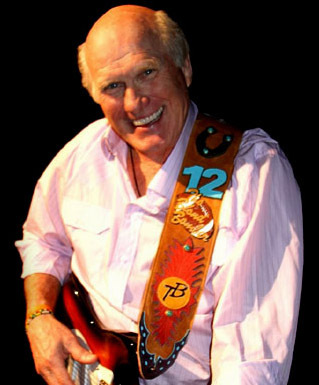 The amazing, funny, talented and completely adorable Terry Bradshaw. Terry used this strap for his Vegas musical, "The Blonde Bombshell". Terry's one of a kind guitar strap includes Southwest style elements along with images of items that mean the most to him. The entire guitar strap is created from leather and handcut kidskin overlays, along with genuine Turquoise gemstones.